This viral video that was captured shows a road rage incident right in front of Salinas Elementary School in Laredo, Texas. The video shows Alejandra Guadalupe Jimenez attempting to cut off other drivers in the pick up line of the elementary school. The video shows Vice Principal of the school trying to re-direct Jimenez. 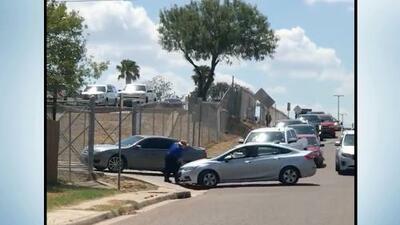 Jimenez used her vehicle to inch forward making an attempt to get in the already established line of vehicles. At one point, the video shows her hitting the Vice Principal while he puts his hands on the hood preventing her from entering the line. Eventually another motorist sees what she's doing and manuvered their vehicle to prevent Jimenez from entering the line. Jimenez gets fed up and reverses agressively and takes off. Laredo Police had caught Jimenez and said that this person had committed a crime. Jimenez was booked and charged for aggrevated assualt with a deadly weapon. She is being held on a $40,000 bond.